The Guide “Birds of Brazil: Pantanal and Cerrado” was created to answer the demands of those who are interested in bird-watching, gathering, through richly illustrated pages, all the species that are found in the habitats of the Brazilian pantanal and cerrado regions. With 336 pages, 1020 illustrations and 740 bird species, the guide is a unique product, a result of the involvement of the greatest specialists in the fauna of such region and some of the world’s best bird illustrators, helped by renowned cartographers. The team responsible for the guide has had the support of research and conservation institutions, scientific databases and the most modern cartography tools and resources. THE GUIDE IS ALSO AVAILABLE IN PORTUGUESE. TO SEE IT, CLICK HERE. In order to make its use easier to carry, the guide is compact size and can be carried in bags and daypacks. The first 50 pages of the book present data on the conservation of the Pantanal and Cerrado biomes and the relevance of the avifauna on their protection. The remainder of the guide has sections that allow the identification of the birds of each species. 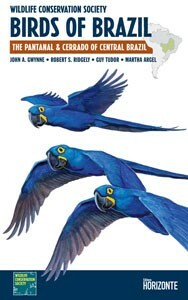 Virtually all birds resident in the Pantanal and the Cerrado, as well as regular migratory species are illustrated in color and with individual descriptions, letting readers go through easy queries. The threatened species and the most important ones for conservation are highlighted. Illustrated with state of the art maps, description of all typical environment of the region, records of areas of highest relevance for the environment and effective actions proposed, the Birds of Brazil guide is valuable not only for its data and information, but also for its concrete recommendations for the conservation of those very important areas for the biodiversity of the region.